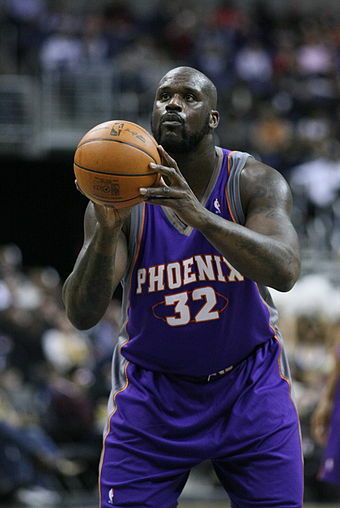 This theme was inspired by seeing SHAQ ATTAQ in the Wikipedia article for Shaquille O'Neal, in search of something new to say about him in a crossword clue. Slightly surprised that the phrase has apparently not been previously used as a crossword answer, I proceeded to round up QUINQUAGENARIAN and QUEBECNORDIQUES (with online assistance) as the best long answers to round out the theme--neither of which had appeared as a Times crossword answer before. The central 9 pretty much requiring four sets of 7's in the corners, I thought it most prudent to deal with the six Q Downs by using the maximum allowable answer count of 78. Careful placement of the 15s and the black squares resulted in three of the Q Downs being three-letter words starting with Q. Dealing with the those Down Qs first, I found the grid not overly difficult to complete. Give yourself extra points if you noticed the two echoes of the theme beyond the longest Acrosses: CUE CARDS at 38 Across and "Quid pro __" (QUO) at 68 Down. Knowing that Will wanted this clued in a fairly easy manner didn't dissuade me from my usual attempt to have as many "brand-new clues" as possible in my puzzles for him. Some required some extra digging, such as the F.C.C. hearings on CSPAN (10 Across). 67 Down came from personal experience: Last year, I took a tour of the Liverpool boyhood home of John Lennon, which included the guide's prominent mention of Yoko ONO as the benefactor. I think the theme is … entries with two Qs? At first, I was underwhelmed, as there have to be a ton of entries with two Qs, yeah? Not the case! I only searched for a few minutes, but the few others I turned up were QUOTE UNQUOTE, UNIQUELY QUALIFIED, QUID PRO QUO, QUADRATIC EQUATION, QUELQUECHOSE, QUEEQUEG, QLEARQUIL, LIQUOR IS QUICKER, BURLESQUE QUEEN(S). Shows what I know! Although having so few theme squares made the theme feel thin, it did allow Stan to play with a wide-open grid. A couple of long entries, the juicy CUE CARDS and MORTIMER, gave me a smile (as I reminisced about "Trading Places" and "Arsenic and Old Lace"), and a whole slew of seven-letter fill in the corners. There wasn't anything sizzling in that mid-length material, but I did appreciate TORPEDO, POITIER, and the good use of the Qs in ACQUITS and MACAQUE. These are all fun words, although I wish at least some of those seven-letter entries had really jumped out at me like CUE CARDS. Speaking of CUE CARDS, is that related to the theme? Or could it have been? Sometimes I think puzzles don't give solvers enough credit when they use an overt "revealer" phrase at the end of the puzzle, summarizing what's going on with the theme. Here, I think there's untapped potential for some wordplay, some fun CUE of CUES phrases that could enrich the theme. Not quite sure what that might be, though. If only TWO CUES or CUE PAIR or something were a real phrase. But Stan does a nice job of smoothly filling his grid, only a minor SCI and … that's it. Pretty darn good work considering he had to work around six Qs — not an easy task. I personally would have preferred more colorful fill, especially more multi-word phrases like CUE CARDS, at the cost of a few more gluey bits. Since the grid is so beautifully clean — pretty much immaculate — I doubt I would have even noticed two or three more bits as minor as SCI. But it's a reasonable decision to go almost perfectly clean, if not that snazzy. Average word length: 4.90, Scrabble score: 336, Scrabble average: 1.76.